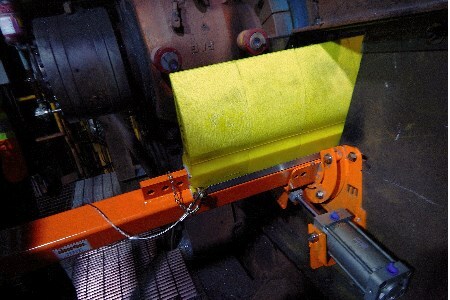 A global leader in bulk material handling technology has introduced a new family of heavy-duty conveyor belt cleaner designs, engineered so the blade cartridge can be pulled away from the belt for safe access and replaced by a single worker. Martin Engineering has developed the Safe to Service (STS) blades to secure both primary and secondary cleaners rigidly to the conveyor mainframe, while offering more versatility and easier access. Initially available on the Martin® QC1™ Cleaner HD, Martin® QC1™ Cleaner XHD and Martin® SQC2S™ Secondary Cleaner, external servicing reduces confined space entry and eliminates reach-in maintenance, while facilitating faster blade replacement. The result is greater safety and efficiency, with less downtime. Designed for conveyor speeds up to 1200 ft/min. (6.1 mps) and belt widths from 18 to 120 in. (457 to 3048 mm), the STS system is well suited to heavy-duty applications faced by industries such as mining, scrap and coal handling. The rugged QC1™ Cleaner XHD primary cleaning blade removes the bulk of the carryback, equipped with a polyurethane formulation to match the application. Primary cleaner urethane blades come colour-coded to suit specific applications and are set in a multi-hole cartridge, allowing the sliding blade rack to be lined up with the material path for effective cleaning. The SQC2S™ Secondary Cleaner uses a tungsten tipped blade on a rigid polyurethane base or rubber buffers, which allow the system to handle belt reversals and rollback with no damage to the belt or splice.